Less than a week after officially accepting the Republican nomination for president, Donald Trump has made his way to Scranton. The billionaire’s taking pains to bill himself as a champion of blue-collar workers. If Trump’s hour-long speech at Lackawanna College had a theme, it was the loss of American jobs. Several times, he vowed his support for the region’s miners, as well as steel and natural gas workers, and promised to “make things fair” again. He says part of his plan will include renegotiating trade deals with countries like China. “They’re going to put you out of business. You’re already mostly out of business. But they want to put you out of business. We’re going to start making things again folks, we’re going to start making things again. That includes steel,” Trump said. The potential voters who turned out in Scranton seemed receptive to Trump’s working-class message. Air force veteran and registered Democrat Bob Hirsch says he feels Trump will unify America. “This president we have in right now has caused so much racial divide in this country. Cause he’s saying that blacks are this and whites are this and Caucasians are this and Chinese people are this. And we’ve got to stop that. There’s no color, there’s no fat, there’s no skinny, there’s no ugly, there’s no beautiful—we’re all one people,” said Hirsch. 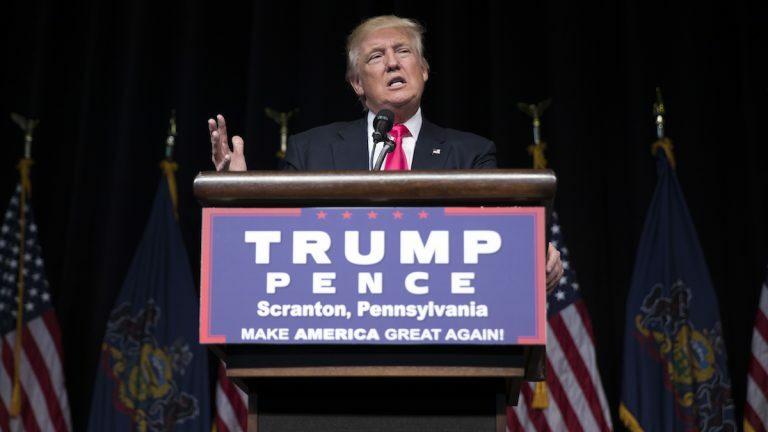 Pennsylvania hasn’t gone to a Republican presidential candidate in decades, but recent polls show Trump as competitive in the state.